#TBT I'm a recovering hipster. I'll admit, I'm actually so much of a recovering hipster that it hurt me a little bit to use the hashtag #tbt. That being said, I'm now a self proclaimed mom. I may not wear mom "jeans" (even though I think they are popular amongst the hipsters these days) but I do love myself some cardigans, pop music, and use trending hashtags willingly. However in the heart of it, I still understand hipsters, and marketing to hipsters alike. I may no longer be one, but I'm still a part of their target market. So why is this relevant? Last week a large part of my team and I attended #INBOUND14 and had a fantastic time. Aside from all of the great content we received, the stand out keynotes, and the education we are walking away with, one of my favorite parts by far was the heated argument between my team (at 2am) about the marketing behind Heady Topper. Let me first start by saying, you know you are in the right career when you choose to stay up late, get passionate, continue the conversation multiple nights after (and then come home and write a blog about it) when you don't even really like beer. I love marketing. I love how marketing works, how it drives demand, and how consumers act and react to the things around them. What is so interesting about this topic is simple. 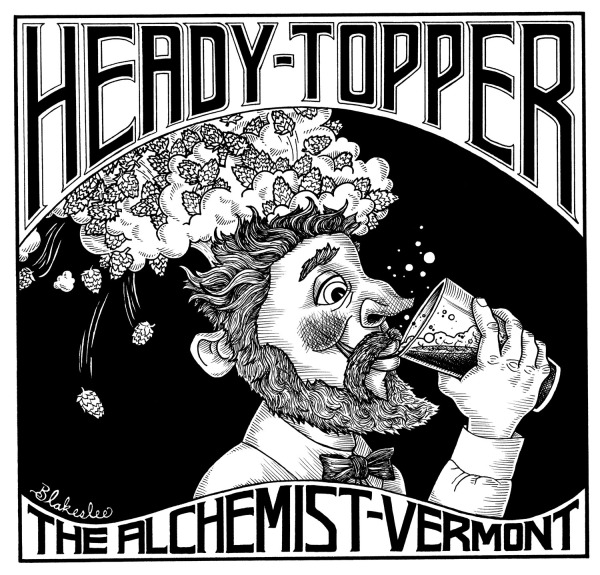 Heady Topper barely invests in marketing. In an article posted 2 years ago, when the hype of Heady Topper was in it's infant stages but on the rise, Jennifer Kimmich (co-owner of Heady Topper) stated “The funny thing is, we haven’t spent a penny on advertising. The demand has been created organically via word-of-mouth.” And what's even more impressive is that is still the fact. While the company has since created a retail line they are still holding true to how they generate interest. Organic word of mouth. With that, here are the the two top trends I believe we can learn and embrace from Heady Topper in our own marketing. Even though Heady Topper doesn't practice the most foundational basics to marketing, it is obvious that they understand their target market and how to appeal to them. Going back to my original statement, if you understand the "hipster" you understand their drive to this beer. It's all about exclusivity. You can't get it anywhere, in fact, when you do come into contact with a case you are the coolest kid on the block. Hipsters are funny, they won't admit they are "hipsters" because they want to be different. But what is different is what makes them a "hipster." (Does that even make sense)! Heady Topper most certainly gives them the exclusivity that they crave. It's also a great beer. Total win win. Then there is the market for craft beer (which Hipsters are also very much a part of). Craft Beer is a growing and expanding market that is becoming more and more established in North America. In fact, craft beer has grown by 10.9% over the last decade and by billions YOY. And Heady Topper leads the pack when it comes to craft beer. What this means for marketing is simple. Make a great product that your market loves and they will trust you. The rise of the Hipster with Heady may be out of convenience due to exclusivity. But the true target market, which is the craft beer evangelist, will remain steady. In a recent interview, John Kimmich (owner of Heady Topper) responded to the main question on "why don't you just make more." And the answer is simple. Quality. Quality takes time, and they are not going to compromise this just for a faster expansion. And that is what craft beer, and really all great companies, are all about. Quality not quantity. People love Heady Topper so much that they will buy it for 600% it's price. According to Wikipedia, Heady Topper retail price is $3.00 / 16 oz. can at the brewery. Black market sales of $18 per can in Washington, D.C. have been reported. That is some serious love. This stands true in marketing and was a huge trend I saw at Inbound. People don't just like Hubspot because it's great marketing software, they love it for everything else that they do, and the value that they bring. When people work with you and your brand, you don't want them to think "meh, that project was ok." You want to WOW them, knock their socks off, and to walk away thinking you are the best company they have ever worked with. That's LOVE. Heady Topper created a love for the brand with what they stand for and how great they are. They provide a world-class quality product that is so loved that it has grown to become the best beer in the WORLD by word of mouth and by only being available in 1 state in the United States. Now that is great marketing, even if it didn't mean to be. So that's it. It seems simple but it takes hard work and a lot of dedication. Not every company can be as lucky as Heady Topper has been in creating demand solely by word of mouth. But what I believe made them so successful was that they believed in their product. They believed in their core values, and the drive to want to create something great. Something that when people consumed it they thought WOW. We can all do that. We can all be a part of this marketing revolution. Know your audience. Make them love you. Whether you are producing beer or generating content you should still always work to create something remarkable. The rest will follow suit. And let's not forget the debate from Inbound. I won't go so far to say who won said debate since there is a 3 year bet at hand. But I don't think I'm speaking just for myself when I say, I can't wait to see 3 years from now where Heady Topper is and what we can continue to learn from them as marketers. Want to take your first step towards great marketing? Check out our content marketing eBook and learn how a great company dresses themselves for success through remarkable content.